One of the issues we all face when traveling overseas is the ability to communicate. If you can’t speak the local language, or if those in the host country don’t speak yours, it can make for some difficult times. The problem is exacerbated when you’re traveling through several countries where different languages are spoken. A good example is Eastern Europe, where the bouillabaisse of languages can leave your head spinning. One solution is to hire a guide/interpreter in each country, which could be expensive depending on how many areas you’ll be visiting. Another – and, perhaps, a better one – is to take a river cruise. Then you’ll be moving effortlessly through several countries and languages all in the comfort of your stateroom, which is why when Royal Viking Cruises invited me to sample their Passage to Eastern Europe package, a cruise on the Danube from Budapest to Bucharest, I accepted their offer. 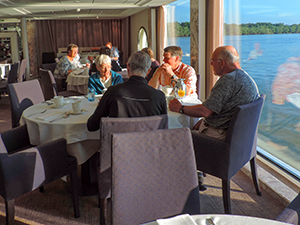 Passage to Eastern Europe is an 11-day (including transit), five-country cruise on which seven nights are spent aboard the 190-passenger Viking Embla. The ship stops at six small ports along the way, with passengers bused inland to see some of the sights away from the river. Viking uses upscale hotels for the land portion of the cruise. In Budapest, we spent two nights at the Hilton, in Bucharest one night at the InterContinental. 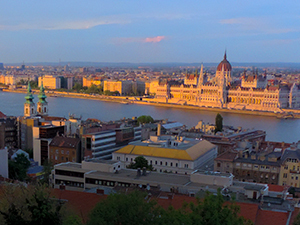 After the day of arrival in Budapest, passengers are given a day of sightseeing on a bus tour about Budapest, and then a half-day to wander on their own before boarding the ship. After two nights at the Hilton we were bused to our ship, the Embla, one of Viking Cruises’ Longships as they’re called, that would take us down the Danube stopping in river towns, and being bussed to a few farther inland, with the tour ending in Bucharest, Romania. My medium-priced cabin was quite comfortable, with good lighting and ample 110 and 220 outlets, plus a decent size bathroom and outdoor balcony. There were plenty of movies, as well as CNN, BBC and other major networks, to view on its large-screen TV. TV reception and Wi-Fi were good all along the river with only a few interuptions. Following two nights in Budapest and a tour of the city, we boarded the Embla right in the center of the city. The next morning, following an informal Welcome Reception and dinner on our first night night onboard, we awoke at a small dock in the Hungarian countryside. 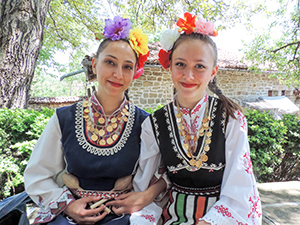 Following a good breakfast – all the meals were very good – buses took us to the small Hungarian town of Kalocsa for a walking tour, before continuing to the Bakodpuszta Equestrian Center, which turned out to be the more interesting venue of the day. There we watched performances by the Hungarian horsemen of the Puszta, cowboys descendants of the Magyar warriors that emigrated to Hungary centuries earlier. 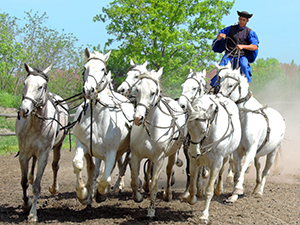 It was a great hit, and included one act that likely was the last thing any of us expected to see in Hungary: a cowboy standing on the haunches of 10 white stallions galloping about a corral at break-neck speed. The performance was accompanied by samplings of Hungarian brandy and other peasant foods, and also, as might be expected, the opportunity to buy Hungarian embroidery and other items in the little market we passed on the way out. Following lunch back on the ship we were off to Vukovar, a Croatian town that bore much of the brunt of the Serbo-Croation war in the 1990s. 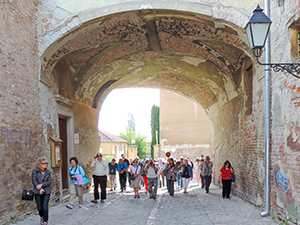 Vukovar was only used as a base to meet our buses though; our destination was the town of Osijek, the 4th-largest in Croatia, where we walked along 18th-century cobbled streets lined with the best-preserved Baroque buildings in the country. While I enjoyed our tour of Osijek, I was stunned the next day when we visited Belgrade, the capital of Serbia. I had been to Belgrade many years ago and had avoided it ever since because I remembered it as a drab, dour-looking city. But now I was amazed at how the city had changed, transforming itself from boring to beautiful. Despite the rain, I became more smitten with the city every place we went. Following lunch back on the Embla, I took an optional tour to the Kovacica Art Colony in a small town further north. I know it was due to my high expectations, but I was somewhat disappointed by the art gallery of naïve paintings; on the other hand, I found our later visit to the home/workshop of a violinmaker fascinating. It was wonderful to watch an Old-World craftsman ply his trade and answer our many questions. It was comfortable aboard the Elba but I rarely took advantage of time to relax on deck since we were always exploring towns during the day and sailing at night. 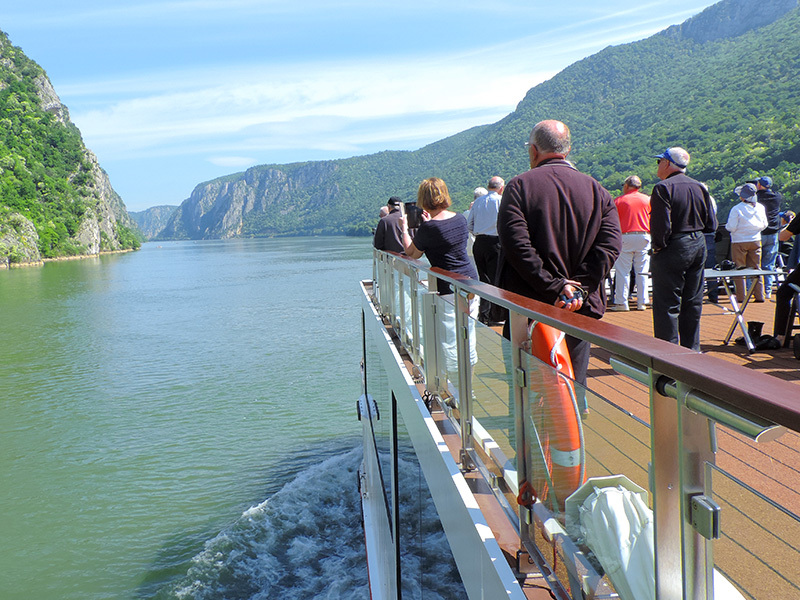 That was rectified on Sunday as we spent the day cruising through the Iron Gates, the narrowest and, to some, the prettiest section of the Danube. It’s a lovely section of the river that is flanked with tall limestone cliffs, a 150-yard wide channel that cuts through the Carpathian and Balkan mountains. One of the most famous sights on it is the huge carving in the rock of the ancient Romanian tribal chief Decebal, completed in 2004. The following day we docked in the Bulgarian port of Vidin to visit the unique Belogradchik Fortress, a stronghold originally constructed by the Romans and enhanced by successive empires. We climbed the rocks about it for some spectacular views of the surrounding countryside. Later that day we visited Veliko Tarnovo, Bulgaria’s former capital, and the town of Arbanassi and were surprised by both. Let loose to wander on our own for an hours in Veliko Tarnovo, I wandered up Rakovski Street, a wonderful artisan’s street, lined with art shops and galleries, and the occasional workshop of a potter or coppersmith. The cobblestone street curved along the hillside, flanked on both sides by century-old buildings filled with small shops and galleries. It was an amazingly photographic and colorful, and even from an architectural perspective quite interesting. Coming out of one gallery I looked up and saw contrails of two jets flying high overhead and felt as if I was in another world, transported back in time. Later on we drove to Arbanassi, just a few miles away and had a delicious lunch accompanied by quite good Bulgarian Cabernet Sauvignon while entertained by local musicians and dancers. After the restaurant, we walked over to the nearby fresco-adorned Church of the Nativity, another over-the-top cultural icon. Our tour ended in Bucharest in another ecclesiastical icon of sorts, the lively and crowded Caru’ cu Bere, a restaurant in the old section of Bucharest that was originally built to look like a church. I never discovered whether that was just local lore or not, but the inside of the place was amazing, and the food quite good. WE done at least 5 river cruises and absolutely love them!! Including Ruissa, China, Egypt, Seine, Danube, Rhine. In February we did the Mekong River from Phnom Penh to Vietnam!! !